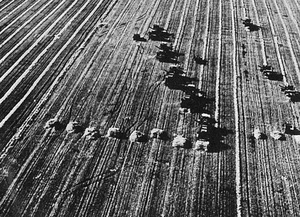 The Russian harvest - more than 30 million tons down on target this year. Third World News is bad news in the first quarter of 1973. Har­vests have failed or fallen short in many of the poorest and most populous areas of the world, including India and Bangladesh. In China and Russia, where har­vests are down on target, contracts have already been signed for the purchase of wheat from the United States, Canada and Australia. This sudden demand on the world's diminishing stockpiles of grain, has forced up the price of wheat on the world market. The greatest danger is the pos­sibility of another monsoon failure on the Indian sub-continent. Present purchases and negotiations on the world wheat market total 28 million tons from the world's stockpile of an estimated 47 mil­lion tons. If Russia and China make further purchases to make up their total shortfalls, there might be in­sufficient stocks to meet the pos­sible Indian need - either com­mercially or on aid terms. The crisis is a particularly bit­ter one for India. Early last year Mrs, Gandhi's government proudly announced the country's indepen­dence in grain and the stopping of imports. But on January 5th this year, Indians were told that the food situation was grave, that two­ thirds of the country was hit by drought, and that the government was viewing the situation as a national calamity. Development in India will suffer. Harvest shortfalls and the high price of imported grain mean that the Indian government will now have to spend $300 million of precious foreign exchange on importing food for short-term relief at the expense of long-term deve­lopment projects - a vicious circle which can only be broken by a determined programme of long-­term agricultural development by India and its friends in the deve­loped world.